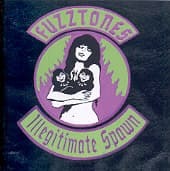 The fuzztones were the band that dragged garage rock n roll kicking and screaming up to date. They are seriously cool. Pointy boots great hair, great clothes, great songs and great attitude. Before your very eyes ladies and indeed gentleman is a 50 track tribute, a compendium of like minded individuals bands of dark celler dwellers, of night creatures, the spawn of the fuzztones, the children, the brood awakened snarling and strumming and a beating of their very bones!